Americans Summer Ross/Sara Hughes, who are in their first year together, finally reached the top of the podium at an FIVB World Tour event, outlasting Brazilian power duo Agatha Bednarczuk/Eduarda ‘Duda’ Santos Lisboa in tiebreak (21-19, 12-21, 15-12) for the Moscow Four Star title. Ross/Hughes, the No. 9 seed in the tournament, earned their first FIVB Tour title and second FIVB medal, following bronze at the Espinho Four Star on July 7. The victory pockets the team the $20,000 purse and 800 ranking points. No. 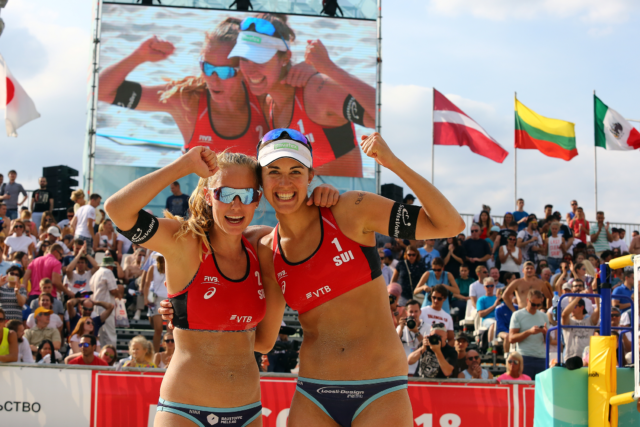 2 Agatha/Duda, , who teamed up in January 2017, reached the podium for the fifth time since Feb. 2017, including tour titles in Itapema (May 20, 2018) and Rio De Janeiro (May 21, 2017) and runnerup finishes at the World Tour Finals (Aug. 27, 2017) and Fort Lauderdale Major (Feb. 12, 2017). After splitting the first two sets, with the Americans taking the first and the Brazilians battling back to win the second, Team USA scored first in the tiebreak, setting the tone for the remainder of the match. Thirteenth seeded Swiss pair Tanja Huberli/Nina Betschart swept Germany’s No. 3 seed Chantal Laboureur/Julia Sude 21-19, 21-12 for the bronze medal. With the third place effort, the Swiss, which were the runners up at the CEV European Championships on July 21, earned their first FIVB podium finish since a third-place showing at the Hague Four Star on Jan. 7.